Tigers are going extinct. A century ago, there were 100,000 tigers in the wild,now there are only about 4,000. Tigerland shifts back and forth between India and Russia, the two places where tigers exist today. Watching this documentary came at an interesting time, as a friend and I had been researching going to try to see tigers in India. Tigerland is about the people who are making an effort to help save tigers in these two places. 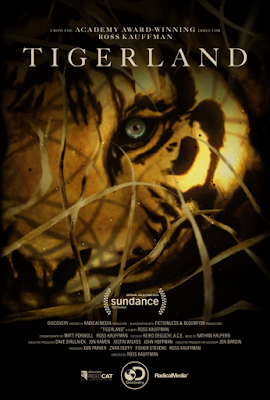 The film focuses on Pavel Fomenko, who has been dedicating his life to help save the tigers for 25 years,and Kailash Sankhala, who died in 1994, who was one of the first people in India that started protecting tigers. We hear his stories through his family members, who are continuing to help preserve tigers, and through research that Kailash had written down. Tigers are going extinct mainly due to poaching, and the destruction of the forest. When the Soviet Union fell, people needed money quickly, and so many became poachers. In India, kings participated in the sport of killing tigers. People would get brownie points if they killed one. Some parts of the documentary, I almost felt like I was there, as men in India were anxiously awaiting to see if they would spot a tiger in the wild. In Russia, it almost felt like I was watching a suspense movie as the team was out urgently searching for tiger cubs. Many species of tigers are already extinct. They are doomed to extinction if things don't change soon. I enjoyed this documentary a great deal. I didn't love the parts with the animated drawings though, and I thought the way the movie began was odd. I actually think this is the first documentary that I have seen on tigers, and I found it very informative. I also found the film beautifully shot, and when we did see the tigers on screen, it was really mesmerizing. We see true dedication from these men, and it makes one feel good to know there are people out there who are trying to make a difference in the world. A must see for any animal or nature lover. I am also hoping that this documentary changes the way that people see tigers in circuses or zoos. TIGERLAND opens in LA at the Monica Center. It opens March 29 in New York at Cinema Village.